Eight years later, the Xbox 360's successor—and Microsoft’s latest bid to take over your living room—is here. Somehow it’s both worth the wait and quite not fully baked. Uh, it’s the Xbox One. The crazy ambitious follow-up to the Xbox 360, a wildly successful console and arguably the winner of last generation’s console war. A box for playing games but also bossing around your television. A future machine. The Xbox One is not only the heir to an absolutely enormous console hardware empire, it’s also an ambitious strike out at the future. It’s a Kinect-driven, media-focused, cable-TV-gobbling machine. It does more than any console before ever has, and does it admirably. At least, when it’s working the way it should. The first thing you’ll notice about the Xbox One is that it is large. Comically large. It looks like a Xbox 360 ate an Xbox 360 slim. It’s more VCR than Blu-ray player. And that’s in addition to the external power brick, itself a heaping chunk of hardware. It makes me nostalgic for my SEGA Saturn in ways I don’t fully understand. And it’s waaay bigger than the PS4. But if all the extra space means none of the red-ringing, overheating problems the Xbox 360 had, it’s more than worth it. Other than its large size though, the Xbox One’s actual console design is pretty subtle, even unremarkable. There are no pronounced angles here, no curves, nothing really to catch your eye. Unlike its predecessors, which aspired in one way or another to be shaped sort of like an X, the Xbox One leans heavily towards box. From the front, it’s little more than just a black rectangle, matte on one side, glossy on the other. It’ll sit under your TV and melt away into the background. The other part of the system that will live beneath your TV is the Xbox One’s included Kinect camera, which is remarkably large as well. It’s roughly the size (and weight!) of a Maglite, but shorter at just 10 inches long. Fortunately, unlike the original Kinect, this one has no automated, moving parts, so it won’t pivot around or bow to you when you’re starting up the system or playing games. Instead it just sits still and looks like a robot face out of Wall-E, or a drunk Johnny 5. A face that will dumbly stare back at you as you dumbly stare at your TV. But how the console—which you will only rarely interact with and hardly ever notice—looks is peanuts next to the controller and oh my god the controller. While it’s roughly the same size as an the already fantastic Xbox 360 controller, the Xbox One controller feels more compact, a little heavier, and more solid, all in a way that’s utterly fantastic. The most obvious changes include a new D-Pad that’s actually a D-Pad, instead of the disc-shaped monstrosity that’s plagued Xbox controllers until now, a guide button that’s moved a little closer to the top of the controller, and the two new “Start” and “Select” replacements: the three-horizontal-lines button and the box-overlaying-another-box button. Annoyingly neither seems to have an actual name (all in game prompts are just pictures of the icon), but both are mercifully in the exact same place as their previous-generation analogues. The Xbox One’s thumbsticks are smaller and easier to move than the Xbox 360's, but in a way that doesn’t sacrifice that feeling of tightness. They also have the most delightful grippy texture around their edges. Then there are the new triggers, which rumble! Like the sticks, they’re easier to pull down, and you’ll notice they’re quieter and issue a soft thud when fully depressed, unlike the almost-squeaky, spring-loaded, almost gun-like clicks you’d get from a 360 controller. It’s definitely different, but still great. Meanwhile the bumpers just above the triggers are slightly larger than they used to be, but still delightfully clicky. It’s not as huge a step forward as the DualShock 3 to DualShock 4, but the DS3 was crap, and Xbox 360 controller was already arguably (I will argue it) the best controller ever. I’m not sure if the Xbox One’s is better yet, but it’s close. It’s hard to tell because I’ve spent so long loving its predecessor. As did the PS4, this thing is going to blow your gat-dang hair back. All the games we tried (Forza 5, Dead Rising 3, Crimson Dragon, and a few titles we’re not allowed to talk about yet) looked beautiful, without exception. You can get graphics like this out of a powerhouse PC, sure. But in the console world the Xbox One—and the PS4—is like whoa. Then again, after eight years, you’d expect it to be. Some titles embrace the future better than others. It’s an unfortunate fact that Dead Rising 3, one of the cornerstones of the Xbox One’s launch line-up, runs in 720p (upscaled to 1080), locked at 30fps. That’s not bad, but it’s not the kind of HOLY FREAKIN WOW you necessarily expect out of your new $500 box. That said, there’s still plenty of HOLY FREAKIN WOW to Dead Rising 3; it boasts massive crowds of zombies on screen at a time, while only occasionally (but still occasionally) stopping to chug if you’re really cruising through the scenery in a car or armored tank or whatever. That’s a different kind of impressive. And it’s worth noting that Killzone: Shadow Fall did its fair share of chugging too on the PS4, albeit in native 1080p. Unlike the PS4's DualShock 4 and its touchpad, glowy-light, share button, and whatnot, the Xbox One controller has no real huge functional tricks up its sleeve. Sitting down to play games on your Xbox One is virtually identical to playing them on a Xbox 360 so far as your hands are concerned. And that’s good! Playing games on 360 was great. What little subtle changes Microsoft has made to its controller mostly melt away once you start to play, in the best possible way. Basic actions like holding the sticks forward are improved by the new textures around the sticks’ rims, but it’s nothing you think about. The rumbling triggers are a little more noticeable, on the rare occasion that they actually start rumbling (at this point, mostly when you’re driving a vehicle, in pretty much every game that has vehicles). It’s cool but it almost always feels like a gimmick. Of course that’s how rumble felt too, before it became a standard. That’s the hardest part of reviewing a console at launch; the Xbox One hasn’t quite settled into itself yet. It was the same way for the PS4. The potential is clearly present in both of them, but how well either fulfills it depends on what’s around the corner, the big games coming up, and how effectively devs can learn to harness the true power hidden inside these boxes. But for now, it’s still hella fun. We like playing games, but Kotaku makes a living out of it. So if you’re looking for something that focuses a little more heavily on the Xbox One’s launch line-up, you can (and should!) check out their review too. If you’re playing games on the Xbox, chances are you’ve got some friends who are doing so too. The Xbox One has a few new social hooks to make keeping tabs on them a little easier. For one, the friends cap is way higher now: 1,000 cronies. Which should be enough for even the most popular Mr. Popular. You can even amass “followers,” people who keep tabs on you but don’t count toward your friend cap because you blissfully ignore them. It’s all very high school cafeteria. And what are you doing with all of these friends and frenemies? Well, the new activity feed offers you a whole faceful off what your they’ve been up to, whether it’s watching TV, using apps, playing games, scoring achievements, or whathaveyou. Nothing about that sharing is particularly new, but it’s nice to see them being applied in Xbox One more seamlessly than ever. Last but not least, there’s the ability to share game clips via the Project Upload app. At any given time during a game, you can say “Xbox, record that!” and the 30 seconds before the command will be saved for later, or you can tell “Xbox [to] record” ahead of time for up to five minutes of footage. After it’s done, you can go and add in voiceover, or picture in picture commentary, even filters, before you push your clips into the activity feeds of all your friends. And if that’s not good enough, you can save your clips to SkyDrive and share them with the rest of the uncaring internet. A notable absence though, is streaming. Xbox One has a deal with Twitch, but the actual ability to use it got pushed back until next year. Meanwhile, the PS4 has Twitch and Ustream at launch. Better a delay than a busted app, but that’s a missing feature that’s leaving a bit of a hole. The Xbox One’s dashboard is an obvious evolution from the latest version of the Xbox 360's UI, but it’s also very much its own entity. The tiles on the Xbox one are far more starkly Windows 8 than anything on the 360. It’s a change that’s fresh, but not alienating. From the moment the Xbox One wakes up, everything is right at your fingertips. Apps, games, notifications, and yeah, a couple of “featured items” that Microsoft would be more than happy for you to purchase. The whole thing can feel a little busy, but it’s easy to pick up and use. And moreover it’s fast. Apps can take a while to load—5 to 10 seconds depending on how intense it is—but you can positively zoooooom around the dashboard with no hiccups whatsoever. And while the tiles here aren’t as “live” as they are on a Windows Phone or Windows PC—they don’t update with helpful real-time info—the tiled setup accommodates a lot of clickables on screen at the same time, with little to no wasted space. We had a few issues with apps crashing or locking up (specifically SkyDrive and Internet Explorer), but our review unit was running pre-release firmware and getting updates at least once a day, so hopefully these kinks are ironed out by launch. Similarly, the “Snap” feature that lets you put TV next to your games, or Internet Explorer next to your Xbox Music, has some real bugs. Snapping an app, unsnapping it, and then loading it up on its own will often bring up the app it was previously snapped to. It can be hard—in a buggy sort of way—to break the two apart. The UI has some nice little flairs, like color settings that you can change to pair with different gamertags. It’s small, but it goes a long way in making it immediately clear who is logged in and driving things. That’s super handy considering that Kinect decides who’s in charge in background with its crazy cyber-eyes, and it’s nice to have a visual clue to confirm at a glance that it’s working (or that it’s not). Speaking of Kinect, the UI is supplemented by a seriously impressive list of voice commands, so no matter what you’re looking at, anything you want is just a yelp or two away. The UI doesn’t rely on voice—you never need to talk to your homescreen—but it’s always there when you want it. Kinect is ostensibly a camera first, but its voice recognition prowess is a huge selling point for the Xbox One, and it is incredible—when it’s working. It’s very clear that Kinect, and its always-listening capabilities, have been a huge part of the Xbox One vision from the start, because this stuff goes deep. Wonderfully deep. In optimal circumstances, Kinect voice recognition is freaking fantastic. Like, sit-in-stunned-amazement-barking-commands-and-pausing-to-squeal-with-glee fantastic. There is hardly anything you can’t do on the Xbox One using voice commands. The only place I ran into a hard stop was the settings menu, and one weird button in another Kinect configuration window. Just about everything else though—switching apps, opening games, customizing your avatar, checking notifications, going to Netflix, making Skype calls, pulling up videos from your SkyDrive—is voice-enabled, and functional as hell. Here’s how a good example of how deep this stuff goes. In Internet Explorer you can actually use a voice commands like “Browse to Gizmodo” and “Click on [linked text].” It’s the first time TV web-browsing has been halfway viable, and that’s not even the best thing about it. The best thing is that there are hardly any limits. And that comes in so handy, when your filthy paws are covered in Dorito dust. That’s not to say it’s all intuitive; there’s a bit of a learning curve. When the Xbox is listening (“Xbox, select! ), and you can just say any green text on-screen, it’s easy. But global commands always, always, always require you to say “Xbox” first. “Go to Skype” will never work, for example, even if Xbox is listening already; it’s always “Xbox, go to Skype.” And games? Full name always please. Never “Xbox go to Forza” always “Xbox go to Forza Motorsport 5.” Devs, please dispense with the subtitles, thank you. There’s a speech tutorial you can download from the store, and you’ll need it, but even then you’ll need a little more time—maybe a half hour of just trying stuff out—to get a feel for it. That will help, but it’s inevitable that you’ll still run up against a failed command, repeat yourself more loudly, and then realize that you’re asking the wrong way. When it comes to listening, Kinect has one hell of a keen ear, but it’s dumb as a rock at dealing with background noise. In the best of conditions (in my smallish-but-not-tiny apartment, alone) Kinect voice commands work with 90-95 percent accuracy, and at absurd distances, quiet volumes, even with pretty poor enunciation. I was able to lay in bed, some 30 feet away, around a corner, and still use “Xbox go home” successfully without really raising my voice. I was able to tell Xbox to pause music from in the bathroom with the door open. But not while I was peeing, because that noise was enough to mess it up. It’s not that Microsoft didn’t take background noise into account. During setup, the Kinect listens for it (but says, “No. Be quieter!” if there is too much), and also listens to sound from your TV, ostensibly so it can cancel it out later. The result is that booming explosions from a game don’t mess up Kinect—you’ll shout in-game Kinect commands even though you don’t need to—but so much as a podcast playing (quietly!) through phone speakers in the same room, our photographer walking around on my hardwood floor with his shoes on, or my girlfriend coughing in the other room because she has a cold, was enough to throw Kinect for a total loop. It generally won’t mis-register commands; it’s more like it just stops listening when it’s confused. When we threw ourselves a little Gizmodo “let’s play with and test out the Xbox One” party to put it through its paces, the Kinect seemed to stop listening after just a few minutes of moderate noise, and not even coming up within two inches of the thing and screaming at it, or chanting as a group would help. It didn’t work again reliably until we were able to manage a level of noiselessness quieter than the tamest book club meeting. So if your gaming zone is reasonably quiet, you are in for an almost Star Trek experience. But if you’ve got roommates, or kids, or dogs, or whatever, you’re probably going to have a lot of “everybody be quiet while I talk to the TV” moments, which really ruins the magic. That’s a shame, because it is magic. But the Kinect is a camera! It does camera stuff too, and also very well in optimal circumstances. The single best thing Kinect does is recognize and sign in players. Automatically. In the background. All the time. With a pretty good success rate, though sometimes with a 10-15 second delay. Part of what makes it so impressive is how seamless it is to train. There’s no “stare at the camera and move your face around so we can see all sides of it.” Nope. Kinect just shows you what it sees on screen, and tries to guess who you are. If it there are multiple people in the room, or it guesses wrong, you just raise your hand to correct it. That’s it. That is the totality of the calibration. And it works well, for the most part. Sometimes you’ll have to correct the Kinect if it doesn’t recognize you, but every correction makes it better. On the one hand this is awesome, but it can also get in the way when you’re hanging out with friends. There’s a long video game tradition of screwing with your bud by messing with the second controller, and Kinect can exacerbate this because instead of messing with you on purpose by pressing buttons, your bud can mess with you accidentally just by virtue of being in the same room and having a face. Likewise I had the same trouble using the Xbox One with my girlfriend (who thankfully looks nothing like me or Stango). But after several times where it apparently confused me for her and showed her stuff when I used the “show my stuff” command, it just went on to work perfectly for 5 more minutes before we stopped the test, seemingly out of nowhere. It’s unclear what’s causing this, but the Kinect works by figuring out who’s talking based on mouth movement, and then recognizing the face. No voice recognition involved. In both tests we started pretty close, and wound up like three feet apart, and there were still errors. It’s a shame Kinect can’t do Moto X-style voice recognition, because maybe then this wouldn’t be an issue at all. Then, on the grander scale, the Kinect doesn’t need as much room as it used to for working most of its magic. At least for smaller gestures and stuff that doesn’t involve, say, dancing. I generally game on my smallish, oldish TV by sitting two feet away from it in a computer chair with my legs crossed, and Kinect never had a problem recognizing just me. It also works well at more exaggerated living room distances of six feet or so. There are Kinect gestures baked into the UI, and selecting things by pushing your hand at the screen is more viable than ever, but that doesn’t mean it’s good. In fact, it’s still pretty dumb, and I found myself repeatedly trying to wave my hands around for just about 10 seconds before giving up. Considering that you probably have a controller nearby, and if not, you probably have a voice, the gestures are a joke even if you do get used to them. In Kinect-based games, the Kinect tech is better than ever. You can tell that it’s understanding you as a person’s skeleton in a wholistic sort of way. In Kinect Sports Rivals Preseasons, for instance, you do some jetskiing, and the Kinect is smart enough to turn you left if you lean left, or even if you keep your upper body totally straight and just kick out your left hip. But even with the better tech, you still end up bumping up against the weird problems inherent to controller-less play. Like the fact that there’s no feedback, or no default zero position. Those are still problems, and they still keep Kinect games from being more than a triviality. In games that aren’t Kinect showcases, the Kinect is mostly superfluous, or at least underused. Granted this is just launch, but from the games we played, the native Kinect implementation mainly boiled down to shouting commands (that were also mapped to buttons) or some sort of motion-control approximation a la Six-Axis on the PS4. Shouting at zombies to distract them in Dead Rising 3 is fun, but non-essential, and an idea that’s been around as long as consoles have had microphones. And unfortunately, since Microsoft wimped out about requiring the Kinect to be kinected, creative uses might not ever progress much further beyond this. One of the primary reasons you might be interested in an Xbox One has nothing to do with games. It’s a full-on living room general, one that commandeers your television and gives it superpowers you’d never dreamed of. That’s the idea, anyway. And it works! Mostly. Especially if you have cable. Xbox One’s TV features come in two flavors. If you don’t have cable, the functionality is limited but still awesome in its own subtle way. Thanks to a built-in IR blaster, the Xbox One will control your TV, and the setup is a dream. All you have to do is tell the ‘box what make your TV is—with a little bit of trial and error—and BOOM, you’re good to go. From there, your Xbox can do most of the most basic stuff your remote would; turning your TV on, turning it off, changing the volume, muting, unmuting, etc. And you can do all that from your controller or with your voice. Saying “volume down” is handy but not life-changing, but things like waking your TV with an “Xbox on” command or muting at a moment’s notice with no remote in sight is. You’ll wonder how you ever got along without it. The Xbox One’s biggest play for “the one box you need in your living room” only really hits home, though, if you have cable. The OneGuide—which will replace your cable box menu if you let it—is a wonder, if not implemented quite as smoothly as you might have hoped. Like setting up your TV, setting up the OneGuide is basically as simple as telling the Xbox your cable provider and make of your cable box. And once the Xbox has slurped up the listing your cable company already makes publicly available for DVRs, the OneGuide’s Metro Modern glory is your new TV interface. The biggest advantage here is being able to make a special menu of just the channels that matter to you, with some streaming app options (your Netflix queue, for instance) thrown in for good measure. This is fantastic. I don’t have to explain to you how great it is to never have to scroll past Nick Jr. ever again, do I? There’s a trade-off though. The OneGuide is slow. Molasses slow. The Xbox One isn’t actually your cable box (yet) and so it’s not really replacing anything; it’s sitting on top. Which means that when you pick out a channel in the One Guide, there’s a bit of a lag and then you see your ugly old cable box interface popping up while the Xbox essentially types in the channel number. The functionality offers a wonderful glimpse at what all cable menus should be, but the application feels hacked together. Mainly because it sorta is. But it works. The other downside is that if you don’t have cable, like me (*high five*), you don’t get to use this. You can have the OneGuide make a faux-cable menu of your favorite on-demand apps, but the lack of HDMI input from a cable box means that the Xbox One can’t put anything on top of your live TV. That means no “Xbox watch TV” command to change input. And that is a huge drag. The Xbox One also has an all new Smartglass app, that’s already out for Windows Phone 8, iOS, and Android. It’s the same basic concept as OG Smartglass—control your Xbox with your phone/tablet—but it’s got a new look, and some new talents. First, it’s matched (roughly) to your Xbox One’s main screen in a way that’s way more one-to-one than ever before. You’ve got pins, recent apps, and all the social stuff like messaging and notifications that’s attached to your Xbox Live account. But most importantly, it’s a more useful remote than ever before. Not only can it just emulate your controller in a way that’s not superb but still damn handy, but it can also help you manage the apps you may have snapped together. So you can navigate around Netflix, and still type in URLs for the snapped IE address bar all at the same time. More than anything though, Smartglass is just yet another way you can control your Xbox without a controller at hand, if for some reason voice doesn’t cut it. And it’s by far the best keyboard option you have for your Xbox One. So while you might never use it, the option is great to have, and better than anything you’ve had to work with before. When it comes to on-demand apps, the Xbox One has pretty much everything you’ve come to expect from a streaming device, and a little more. You’ve got your Netflix, your Hulu Plus, your Amazon Instant, and even HBO Go (*coming soon). And they’re all functional versions of the services you expect, but some take more advantage of the Xbox One’s special talents than others. But it’s unfortunate and worth noting that none of them have any sort of “voice search” options. Whether that’s because they didn’t add any or because Microsoft won’t lend Bing’s power to searching anything but the Microsoft store is anyone’s guess. But it’s a bummer that there’s no “Xbox watch Archer on Netflix” capabilities anywhere. At least, not yet. That said, it’s hard to knock Xbox for offering up a totally good library of apps that totally functions with traditional controls. But it’s also hard to not wish there was more Xbox One magic in here. Netflix has a snazzy new tile-based look for the Xbox One, but underneath that flashy surface it’s actually a pretty bad version of the app, at least for now. Instead of showing your queue on the front page—or anywhere? We couldn’t find it—the Xbox One’s Netflix app defaults to “Popular on Netflix” and lets you swipe through a series of genre-based pages. Which is questionably useful if you’ve got something you specifically want to watch. If that’s the case, you have to type out your choice from a row of letters. It works, but it means that neither smartglass or voice can save you from arduously chicken-pecking your query. It’s a real bummer. Hopefully it’ll change sometime in the near future, because it’s functional but sort of a joke right now. Way too old-fashioned for such a new-fashioned device. The Amazon Instant Video app harbors no real surprises. It’s a pretty standard interface, much like the one we saw on the PS4, and it’s particularly suited to browsing with a controller if you’re just cruising to see what’s up for grabs. Unfortunately it suffers the exact same keyboard issue as Netflix, and opts for some BS line of letters instead of leveraging the built-in Xbox One keyboard that pipes back to Smartglass. It’s totally functional, it just doesn’t take advantage of all the goodies the Xbox One provides. Luckily the Hulu Plus situation is a little bit better, and the rather traditional layout the app sports comes with moderately robust voice commands you can use to scroll around the page if that’s what you’re into. But you’d be better off just picking up a controller or going to search. If you want to search for something, though, you’ll wind up having to use a keyboard again, but at least Smartglass can ease your pain a little bit. Again, it’s totally functional—and fortunately better than Netflix—but you’ll want your controller, unfortunately. Of course, streaming apps are all old hat. The Xbox 360 had ‘em, and the PS3. But the Xbox One does have a unique advantage to bring to the table SkyDrive. Got some old .mpegs, a couple old .avis, some pictures even? If they’re on SkyDrive, they’re as good as on your TV. That’s huge for Windows Phone 8 smartphone photographers, but also lets face it: pirates. But if you’re either of the two, it’s something worth getting excited about—and worth using SkyDrive for. The Xbox One is a future machine. It plays games and plays them well, but it’s also so much more, in this really wildly ambitious way that it mostly manages to pull off. The voice commands and Kinect functionality is baked into the Xbox One so deeply it feels positively space-age. The first time you start zooming around the interface by voice just to see how much you can do is a revelation, and every time the Kinect logs you in by face is a joy. And that’s only a fraction of the extras the Xbox One has in store. If you have cable, the ability to replace your horrible channel menu is a god-send, and even if you don’t, the Xbox One’s most basic level of TV control is an absolute joy. It’s really amazing how much this one box does and does competently, if not always perfectly. But if godlike voice control over your dashboard and the future of television interfaces aren’t your thing (you maniac!) they’re also completely avoidable. You can just play games with a controller. You never have to talk to your Xbox One, or wave at it. You can put a blanket over the Kinect, or even disconnect it entirely—though for the record, you’d be missing out. And what’s more is that this is all working out of the box, with a setup that’s easy as pie. 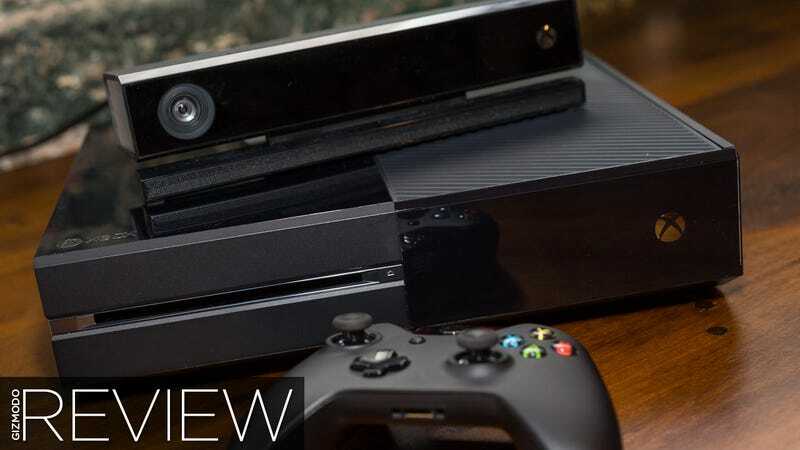 The Xbox One feels like the future, and it feels like it now. For as well as the Xbox One executes on its promises on day one in optimal circumstances, it’s not always perfect; every hiccup brings you crashing back down to Earth in an instant. Unresponsive voice commands are rare under good circumstances, misconstrued ones are rarer. But they do happen—almost invariably when there’s someone else in the room that you are trying to show them off to—and it’s a gigantic bummer when they do. As a rule of thumb, Kinect lives up to its potential only if you’re alone. The Xbox One is certainly a powerhouse compared to your 360, but there are little exceptions in the launch lineup that are troubling. Like Dead Rising 3's 720p-ness. Likewise, Call Of Duty: Ghosts is upscaled 720p too, as opposed to native 1080p like it is on the PS4. Xbox One games still look amazing, but it’s worrying that a cross-platform blockbuster like COD is explicitly toned down on the Xbox One. Xbox Live is also still a ripoff, and the Xbox One doesn’t change that. In fact, it makes it worse. Sure, the PS4 is charging for multiplayer this time around, unlike on the PS3, but for the Xbox One to hide streaming apps behind a paywall while still trying so hard to be a media box is truly absurd. Not yet. It’s generally dumb to buy any new console right at launch. PS4's have been having issues with a “blue light of death,” and for all we know the Xbox One could have its own issues as well; the sting of the red ring of death is still fresh in most memories. Besides, the launch line-up of games—while a little better than the PS4's—is a bit soft. The real gotta-play system-sellers like Watchdogs, Destiny, and Titanfall, are still a few months out. Halo 5 is a mere glint on the horizon. The software is still in flux too. We experienced a little jank with a few apps. Twitch streaming isn’t coming until sometime early 2014. HBO Go is “coming soon” but hasn’t shown up yet. These consoles are coming in hot, so just chill. Theoretically all will get fixed with time; hopefully right around when a game you just have to have finally gets released. For now, the Xbox One is one impressive living room box machine—and it more than justifies its $500 dollar price with the inclusion of at least $100-worth of set-top boxitude—but you’re going to be better off waiting for a little while to see how things shake out. But—and this is admittedly a sizable but—if the Xbox One can straighten the few little quirks it has with some software tweaks, this thing is going to be unstoppable in a way the PS4 could never touch. It’s too versatile, too feature-ridden, too future. So wait, yes. But while you do, go ahead and start clearing out plenty of space underneath your television.